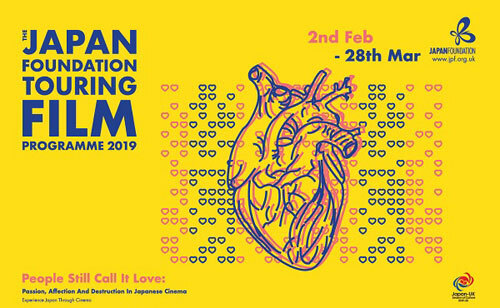 Following 137 screenings nationwide over a two month period, the largest edition of the Japan Foundation Touring Film Programme to date draws to a close. Featuring a lineup of 18 works, ranging from blockbuster action, retrospective classics, anime, to boundary-pushing documentaries, the programme toured 19 cities around the country, including new partner venues in Halifax (Square Chapel), and Newcastle (Tyneside). In this 16th edition of the programme, we were proud to bring more attention and prominence to the influence of women on Japanese cinema by including several films which have been directed by female filmmakers or adapted from literature written by female writers. This year we also welcomed three very special guests, Keisuke Yoshida (director of Thicker Than Water), Hikaru Toda (director of Of Love & Law) and Yukiko Mishima (director of Dear Etranger), all of whom took part in post-screening discussions of their films in London and around the UK. 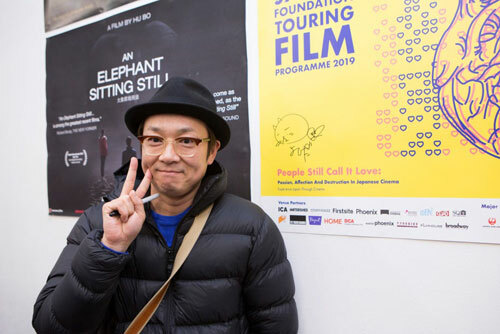 Director Keisuke Yoshida visited the UK to attend screenings of his film Thicker Than Water, one of two titles directed by him in 2018, being closely followed by his latest work, Come On Irene. Having been very well received at international festivals, including a sell-out screening at New York’s JAPAN CUTS festival, Thicker Than Water impressed our UK audience with shows in seven cities. Appearing at two London screenings of the film at ICA (which marked the UK premiere), Yoshida then travelled to Derby (QUAD), Chester (Storyhouse), Bristol (Watershed), and Sheffield (Showroom). 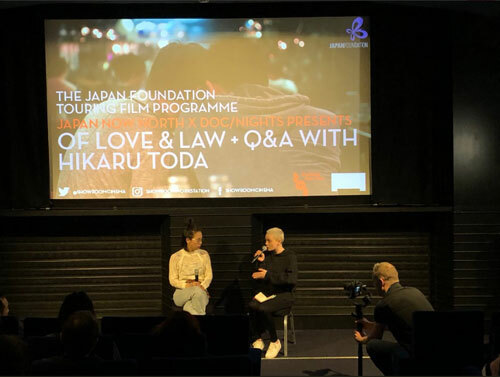 Another highly anticipated appearance as part of the season was that of rising female filmmaker Hikari Toda at the screenings of her documentary Of Love & Law at London (Curzon Soho), Sheffield (Showroom), and Manchester (HOME). Already popular within the film festival circuit having screened to large audience at BFI’s Flare and London Film Festivals, Toda’s sensitive exposition of LGBTQ issues and the lives of minorities in Japan was warmly received by the programme’s audience, ahead of the film’s theatrical release in the UK. And then in late March, we were joined by Yukiko Mishima, director of poignant family drama Dear Etranger. Following the film’s widely popular screening at 11 cinemas nationwide, director Mishima joined us for an exclusive ‘Filmmaker Talk’ at The Soho Hotel in London where she discussed her work and career with Dr Irene González-López. In addition to this standalone talk, Yukiko Mishima embarked on a mini-tour of the UK, attending special Q&A screenings in Edinburgh (Filmhouse), Nottingham (Broadway), and Exeter (Phoenix). Among the titles, we were proud to bring to the audiences a brand new release, Born Bone Born, which premiered in the UK simultaneously with its Japan-wide roadshow. Based on an acclaimed short of the same title, this is the second feature from director Teruya Toshiyuki (a.k.a. Gori) which won him the Audience Award at JAPANCUTS. 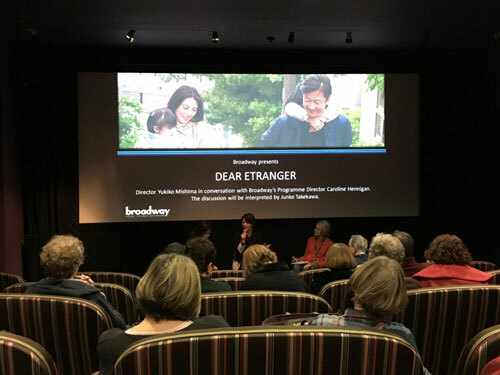 The film’s light-hearted and humanistic approach to family grief and regional traditions had universal appeal in the UK, while its London screening was supplemented by a delightful live performance of authentic Okinawan music. ICA’s fastest selling screening of the season was that of viral sensation Dad’s Lunch Box, which was made all the better with a very special giveaway of cute Japanese lunchboxes (provided by Japan Centre) to one lucky winner of each screening across the country. Furthermore, all screenings of Born Bone Born were accompanied by a giveaway of limited Okinawa-themed goody bags, courtesy of the Okinawa Film Office. And here are some lovely comments from our audiences! 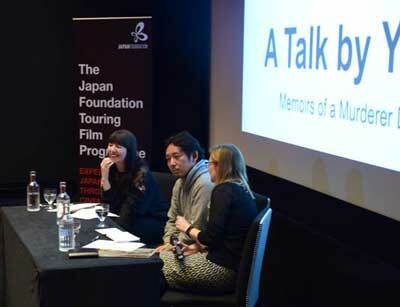 Thank you to everyone who attended the Japan Foundation Touring Film Programme this February and March! We look forward to seeing you again at the 17th edition in 2020! Thank you also to our filmmaker guests, partner venues, our major supporters (Japan Airlines, Yakult and the Great Britain Sasakawa Foundation), sponsors in kind (Japan Centre and the Okinawa Film Office) and our cultural partners (the Japan Society and Modern Culture) who helped make this season a success! Following 131 screenings nationwide over a two month period, the largest Japan Foundation Touring Film Programme to date drew to a close in late March. Featuring 16 titles, ranging from crime thrillers, classics, period pieces to anime, the programme toured to 18 venues around the country, including new venues in Colchester (Firstsite), Chester (Storyhouse) and Lewes (Depot). This year we also welcomed three very special guests, Kosuke Mukai (screenwriter of Gukoroku – Traces of Sin), Masahiro Motoki (cast of The Long Excuse) and Yu Irie (director of Memoirs of a Murderer), all of whom took part in post-screening discussions of their films in London and around the UK. Screenwriter Kosuke Mukai visited the UK to attend screenings of the most recent film he worked on, Gukoroku – Traces of Sin, adding to his already impressive canon of work (which includes The Cowards Who Looked to the Sky). Appearing at two London screenings of the film at ICA (one of which officially opened this year’s programme), Mukai then travelled to Watershed in Bristol, and Macrobert Arts Centre in Stirling. 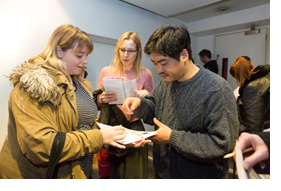 Another high-profile appearance as part of the season was that of popular Japanese actor Masahiro Motoki at the screening of his film The Long Excuse at ICA, London. Perhaps best known for starring in the Academy Award winning Departures, Motoki’s presence attracted one of the biggest audience numbers at this year’s festival, leading to another sold out screening! And then in March, we were joined by Yu Irie, director of crime thriller Memoirs of a Murderer. Following the film’s widely popular screening at ICA, London in February, Irie joined us for an exclusive ‘Filmmaker Talk’ at the Soho Hotel in London. In addition to this standalone talk, Yu Irie embarked on a tour around the UK, attending special Q&A screenings in Sheffield (Showroom), Nottingham (Broadway), and as far as Belfast (Queen’s Film Theatre). Among the titles, Yoshihiro Nakamura’s twist on the ninja legend, MUMON: The Land of Stealth, proved to be an audience favourite, with the highest turn out rate up and down the country. We have a sneaky suspicion this popularity had something to do with the cast – the film starring none other than Arashi’s Satoshi Ono in the role of the protagonist. The film's screening at ICA was the fastest selling film of the season! Furthermore, certain screenings of the film nationwide were accompanied by the presence of a mysterious ninja handing out goody bags to the lucky few members of the audience, see below. 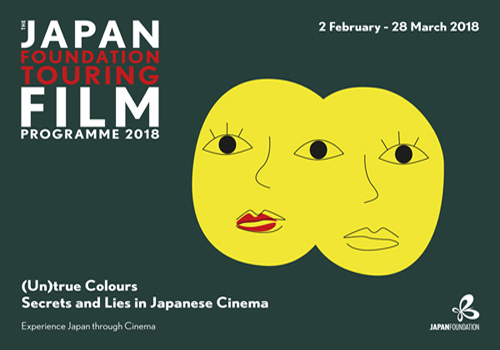 Thank you to everyone who attended the Japan Foundation Touring Film Programme this February and March! We look forward to seeing you again at the 16th edition in 2019! 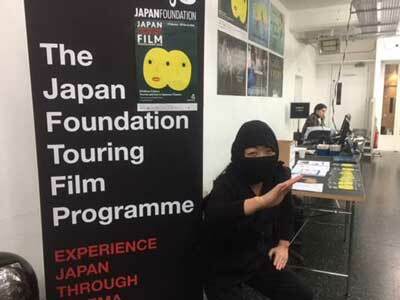 Following 103 screenings nationwide over a two month period, the largest ever Japan Foundation Touring Film Programme drew to a close in late March. Featuring 14 titles, ranging from contemporary films, classics, documentary and anime, the programme toured to 15 venues around the country, including new venues in Stirling (Macrobert Arts Centre) and Inverness (Eden Court). This year we also welcomed three very special guests, Naotaro Endo (director of Tsukiji Wonderland), Daishi Matsunaga (Pieta in the Toilet) and Shuichi Okita (The Mohican Home Comes), all of whom took part in post-screening discussions of their films in London and around the UK. 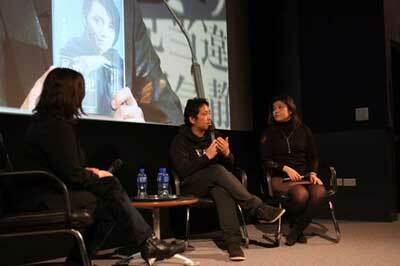 Director Daishi Matsunaga visited the UK to attend screenings of his debut feature film Pieta in the Toilet. In addition to appearing at the film’s UK premiere at ICA, Matsunaga also travelled to Watershed in Bristol, Showroom Cinema in Sheffield and Quad in Derby. 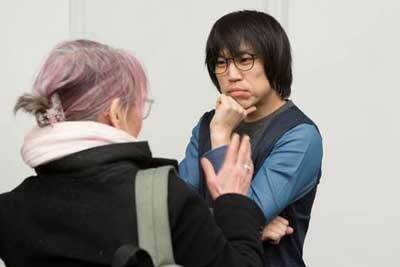 Another of the 9 UK premieres shown as part of the season was Shuichi Okita’s latest film The Mohican Comes Home. Two of Okita’s films have been released in the UK (Woodsman and the Rain and The Story of Yonosuke) and his fans turned out in numbers for the screening at the ICA! Okita also attended screenings of The Mohican Comes Home at the Queen’s Film Theatre in Belfast and Exeter Phoenix. And then in March, we were joined by Naotaro Endo, director of the season’s featured documentary, Tsukiji Wonderland. 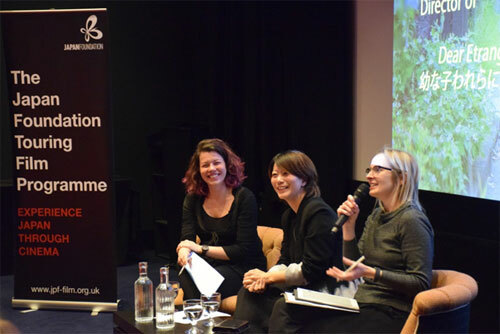 Following the film’s sell-out screening at ICA, London in February, Endo joined us for an exclusive ‘Filmmaker Talk’ at the Soho Hotel in London, before embarking on a tour around the UK, attending screenings in Broadway in Nottingham, Filmhouse in Edinburgh and Exeter Phoenix. Among the titles, Naoko Yamada's anime A Silent Voice proved a huge hit, selling out screens up and down the country. The film's London premiere at ICA as part of the programme was the fatest selling film in the programme. On the day of the screening the queue was stretching out of the door - see below! All events, every year, something new comes to us. It's really great! Thank you for your efforts. Great work! Thank you so much for showing so many wonderful films. I'd love to see more Japanese films in cinemas! There isn't enough and it is very popular! 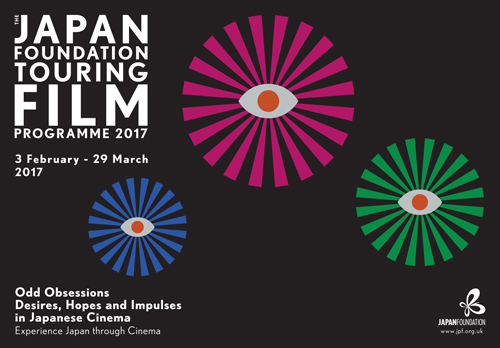 Thank you to everyone who attended the Japan Foundation Touring Film Programme this February and March! We look forward to seeing you again at the 15th edition in 2018! The Japan Foundation is now accepting proposals for projects to receive Performing Arts Japan Programme for Europe (PAJ Europe) Touring and Collaboration grants for the 2017-2018 fiscal year. To apply for the programme, please read the information on the Performing Arts Funding page carefully and contact the relevant Japan Foundation office in Europe to discuss eligibility. The deadline for projects taking place between 1 April 2017 and 30 June 2018 is Monday, 31 October 2016. Performing Arts Japan Programme for Europe (PAJ Europe) was started by the Japan Foundation in 2006 to revitalise and facilitate the exchange between leading artists in Europe and Japan. The main feature of this scheme is that this grant will be made available to those organisers based in Europe who are planning to organise Japan-related performing arts projects in European regions. The applications will be screened by an annually appointed panel of advisors who are specialists in the area of performing arts in Europe. Successful applicants will receive grants towards part of the cost of implementing their project. To date, PAJ Europe has funded 128 projects (including 70 touring and 58 collaboration projects) of Japanese performing arts in both traditional and contemporary art forms. In the 2016-2017 fiscal year, 12 projects (5 Touring and 7 Collaboration projects) were selected under the programme, for a total amount of €149,000. This year’s programme is titled ‘Ikiru: The Highs and Lows of Life in Japanese Cinema’, and taking inspiration from Akira Kurosawa’s classic Ikiru (“To Live”) will look at the way in which Japanese filmmakers have been observing and capturing people’s lives. This year’s programme is the largest yet and will feature a mixture of classics, animation and contemporary films, catering for all audiences’ tastes! Specific information of each cinema’s line-up, screening dates and times will be added to www.jpf-film.org.uk shortly, so please keep checking back. We look forward to seeing you all at the programme soon! The Japan Foundation is now accepting proposals for projects to receive Performing Arts Japan Programme for Europe (PAJ Europe) Touring and Collaboration grants for the 2016-2017 fiscal year. To apply for the programme, please read the information on the Performing Arts Funding page carefully and contact the relevant Japan Foundation office in Europe to discuss eligibility. The deadline for projects taking place between 1 April 2016 and 30 June 2017 is Friday, 30 October 2015. To date, PAJ Europe has funded 116 projects (including 65 touring and 51 collaboration projects) of Japanese performing arts in both traditional and contemporary art forms. In the 2015-2016 fiscal year, 7 projects (3 Touring and 4 Collaboration projects) were selected under the programme, for a total amount of €85,000. Tabaimo to represent Japan at the Japan Pavillion as part of the 54th International Art Exhbition la Biennale di Venezia. "Traditional Music Today: Performing Arts in Japan" has now been published!